Hobby Lobby I Love This Cotton! Orders over $15 ~ Use code SAVE10 for 10% off your order. Orders over $25 ~ Use code SAVE15 for 15% off your order. Orders over $50 ~ Use code SAVE20 for 20% off your order. 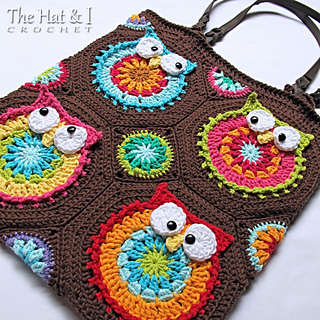 Silly, colorful owls make for a FUN and OOAK tote! This is not an easy/beginner project. However, the pattern includes a HUGE amount of photos (over 60) with step-by-step instructions to help guide your hook to completion. 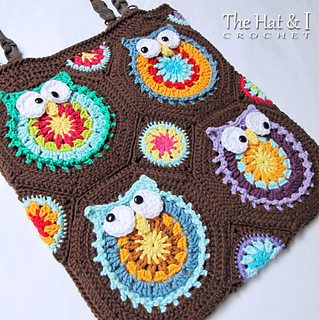 Pattern does not include motif color selection…that’s the fun part for YOU! Pattern is written in standard American terms. 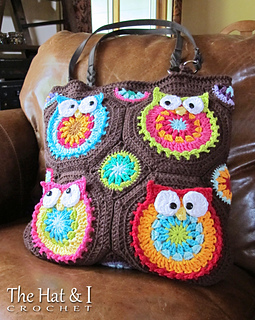 You are welcome to sell what you make using my patterns. Please include a link or reference to my shop (www.etsy.com/shop/TheHatandI) for the pattern. Pattern is copyright protected; it should not be reproduced, redistributed, or displayed publicly in any way.